My whole house filled with the smell of roasted coconut when I made this salad. I closed my eyes and imagined I was smelling tanning lotion at a Pesach hotel instead of cooking in Chicago. A girl can dream, right? I’ve been making Pesach since I was newly married, only months after I learned to cook noodles and eggs. I know ladies in their 80s who have yet to conquer one. To anyone who is making their first–here’s all you need to know: prepare lots of fresh salads, vegetable dishes, quinoa and sides of meat. Give it a try one year; it’s not so hard. And I’ll take your place in the sun at the Pesach hotel. 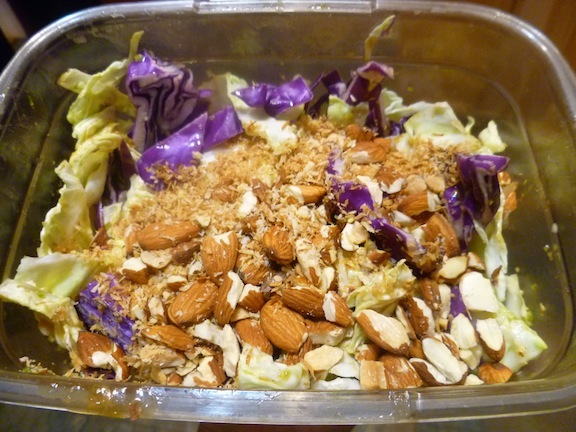 Set a pan over a medium flame and add the almonds and coconut flakes together. Roast them in the dry pan and shake every few minutes until lightly brown (about 8 minutes). Shred and wash the cabbage and let it dry. Add the dressing (below) and scallions and almond mixture on top. Smells good and tastes good too!